On July 26th, Mayor Lee signed the City’s budget, which enacted a $10 billion budget for the City and County of San Francisco for Fiscal Year 2017-18. As adopted, the Ethics Commission’s $4.5 million budget for FY18 will enable us to continue to build critically needed capacity for improved outreach and compliance efforts and strengthened operations and oversight across all program areas. Slide 1 below illustrates our FY18 budget and how it is allocated, overall. With enactment of the budget, we have been able to move forward with new positions that were authorized in the new budget. In that regard, I am very happy to inform you that Gayathri Thaikkendiyil will assume a permanent role on our staff leadership team as our new Chief Programs Officer, effective September 9, 2017. Gayathri has been serving as a FUSE/Mayoral Executive Fellow with our office since last October. In that capacity, she has lent her significant business and organizational knowledge, experience, and insights in a consultative role to identify and apply technology solutions to improve our compliance assistance through innovation and a more user-focused experience. In her new role, Gayathri will provide leadership and day to day management for our Engagement & Compliance Division, overall, including the areas of public engagement, digital content, program innovation, and performance reporting. Gayathri and our expanding E&C team will be working to continue strengthening our outreach and engagement activities, while also developing innovative compliance guidance across the full range of our campaign, ethics, and lobbying-related programs. Prior to her one-year FUSE Fellowship, Gayathri managed large-scale customer service projects and various application development projects for over 10 years with American Airlines. She led a staff of 22, included teams that were geographically dispersed and cross-functional. She holds an MBA from the University of Texas at Austin, an MS in Computer Science from the University of Texas at Austin, and a Bachelor of Engineering in Computer Science from the University of Madras. As noted in my June report, we also were pleased this summer to welcome two others to our staff. Jeffrey Zumwalt and Pat Ford both started on July 3rd. As our new Investigative Analyst, Jeff has over 10 years of experience with investigations in the public sector, at both the Virginia Tech Police Department and the Metropolitan Police Department in Washington, D.C. He holds a B.A. in Criminology and Criminal Justice from the University of Maryland, and a Master’s degree in Public Administration from the University of Maryland. Pat Ford joined our new policy unit as our Policy Analyst. Most recently, Pat was a Corporate Associate with the law firm DLA Piper, where he worked on venture capital financings and merger and acquisitions. He has previous experience with the practical side of campaign finance compliance and reporting laws as a Contribution Coordinator based in the Southern California region. Pat holds a BA in Philosophy from the University of California, Santa Barbara, and a JD from McGeorge School of Law at the University of the Pacific, where he was also a member of the Law Review. Over the past two months, Staff also have worked to develop, finalize, and discuss with their respective supervisors individualized annual performance plans for FY18. These individualized plans link a position’s duties and specific fiscal year goals and objectives with the Commission’s broader organizational goals and priorities. Establishing these plans at the outset of the fiscal year helps support successful job performance throughout the year by identifying key objectives to guide our work. A mid-year check-in allows flexibility for any recalibration that might be needed due to changing priorities or circumstances. An illustration of the FY18 performance review process appears in Attachment 1. During a two-day Annual All-Staff meeting earlier this month, we took the opportunity to highlight recent progress as a staff team and focus on both substantive and operational areas of our work. Topics included refresher primers on ethics, campaign finance, and lobbying; training on our record retention policy; professional development resources; and updates on ways our work flows and work tools continue to be transformed. 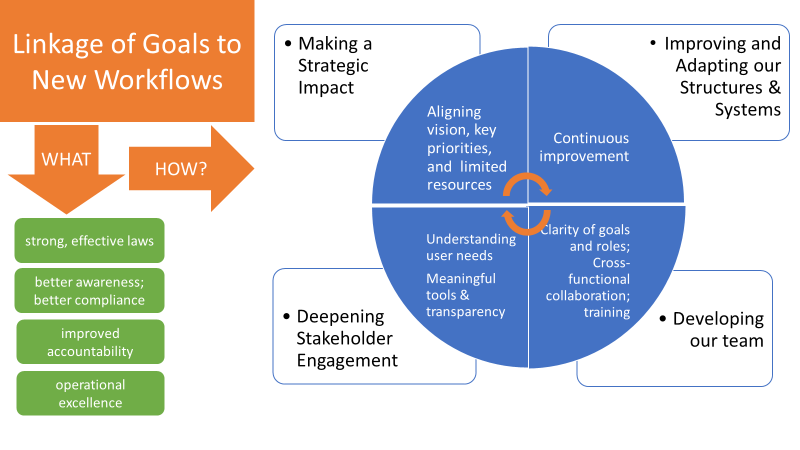 As illustrated by Slide 2 below, we also used our time together to further review key departmental goals and the ways that our new work approaches can help deepen the impact of our work on the public’s behalf. We also continue to make progress on filling our staff vacancies. In addition to the hiring of our new Chief Programs Officer, the application period for two other positions has now closed. Those positions are moving into the qualification review and assessment phase. Table 1 below shows the status of hiring efforts for these and other positions at the Commission. As a part of our mission to help inform City employees and officials about ethics laws, we want to pro-actively work with City departments to raise awareness about employees’ compliance obligations and share information about how the Commission can support them. We recently collaborated with Staff from the MTA department to develop a pamphlet about the Ethics Commission for use in their new employee orientation packet. Our shared goal was to help new employees be better informed about ethics related filing requirements during their onboarding process. A copy of the brochure appears at Attachment 2. We look forward to seeking similar opportunities to enhance our outreach efforts as we expand our Engagement & Compliance team in the coming months. On August 18, 2017, several members of the Commission Staff and I attended an all-day meeting of staff from other local ethics agencies to discuss current and ongoing trends in campaign finance, lobbying, ethics and the administration of local ethics commissions. The day was organized into two plenary discussions on technology developments and general organizational updates. A number of breakout sessions allowed more focused discussions on topics such as anti-corruption measures, investigative best practices, public financing, and communications and public engagement. Also attending the meeting in Oakland were staff from the Oakland Public Ethics Commission, San Diego Ethics Commission, Los Angeles City Ethics Commission, Berkeley Fair Campaign Practices Commission, the City of Sacramento’s Office of Good Governance and Compliance, the Orange County Office of Campaign Finance and Ethics, and the Fair Political Practices Commission. As noted in my June report, final audit reports remained pending in June for five 2012 publicly financed candidates. We completed those reports by the end of the fiscal year and are now current with our campaign audits. Campaign audits are now underway for publicly financed and non-publicly financed candidates from the 2016 election cycle. Auditors Manisha Lal and Amy Li and I have met with teams from the City Services Auditor and its contract auditor team to provide relevant background information and materials to support their audit work. 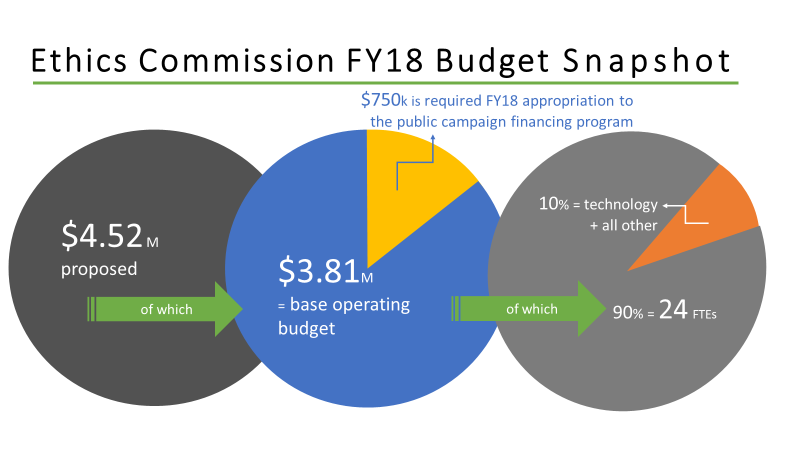 Initiated in 2016, the Commission’s Annual Policy Plan is a planning tool used by the Ethics Commission to identify issues it plans to consider and potentially act on in the current fiscal year. Since its implementation at that time, it has also been a regular attachment to this monthly report to provide regular updates about when issues are likely to be scheduled for review and discussion and help promote effective public engagement in that process. With our new Policy unit now up and running, updated Annual Policy Plans will now regularly appear as part a monthly Policy Report by Staff. That Report appears this month as an attachment to Agenda Item 4 on the Commission’s August meeting Agenda. Table 2 shows the revenues received by the Commission during the fiscal year that began on July 1, 2017, as of August 15, 2017.